Finishing robotics is a fast growing Swedish company in the industrial robotic field. 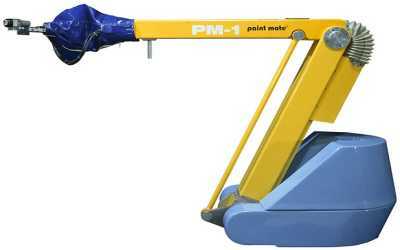 We specialise in robots that do automated paint and surface treatment eg. painting, coating, finishing and grinding. The robots are some of the few (if not the only) robots that may be taught in many different ways.This makes them easy and fast to handle. You can mix the various teaching methods to suit your particular needs. The system is totally modular which enables the customer to upgrade or "downgrade" the robots for new or changing specifications. This makes the robots very versatile. They will never become out of date.